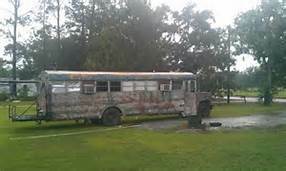 See this great old school bus. It is so much nicer than the one Daddy acquired for the unbelievable sum of fifty dollars. He purchased it from his brother-in-law, who’d gotten stuck with it as payment body work. Daddy was ahead of his time In acquiring this Tiny House. Mother was furious. Fifty dollars would have bought more than two week’s supply of groceries. 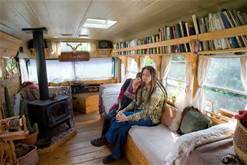 Though he gave Mother no end of grief about her extravagant spending at the grocery store, he wasn’t short-sighted and saw the great potential in this bus-camper. It would be a wonderful shelter when he and his buddies went deer hunting, and oh yes, the family could use it for camping, too! Now our camper wasn’t nearly so nice as the one pictured above. It had been partially hand-painted bright silver and lacked a motor. The good news was, we could finish it up any color we liked and motors take up a lot of unnecessary space better used for storage. In that special storage area, items were stored in boxes on one deep shelf or in boxes on the floor beneath the shelf. While the rest of us were out fishing, swimming, or just running wild in general, Mother drug boxes out and dug through them for dishes, pots and pans, and food, all this with two babies in diapers. She complained about her back constantly. What a whiner! See how comfortable and well-appointed the camper pictured above is. Ours was nothing like this. There was no refrigerator, lighting, water, bathroom, hard-wood floors, or Benjamin Franklin wood burning stove. There was, however, an ancient gas range Daddy hooked to a propane bottle. It had two functioning burners and a defunct oven. That was okay, since Mother insisted it had a propane leak and she was scared to use it longer than it took to heat a can of beans or cook eggs. She cooked with all the windows open and made Daddy cut the fuel off every time she got through. In fact, it did have a propane leak in the line, but that’s a story for another day. Two full-size bunk beds filled the rear of the camper. Two sets of old army bunks were stacked along either side. Of course, we fought over the top bunks. The lower bunks served as seating. A lantern and flash lights served when light was needed. It was perfect. I remember one wonderful camping trip when Daddy pulled it to a creek bank. We swam, fished, swatted mosquitoes, cooked outdoors, only going in to sleep, so exhausted we hardly moved till morning. Mother got up several times every night to spray to camper with bug killer and spray the covers and any exposed skin with mosquito repellent. We scratched bug bites and poison ivy for days after we got home. That was our only family camping trip. Daddy used it a time or two for hunting, then gave it up as too much trouble. It had a couple of other incarnations as a home for a farm laborer who confirmed the stove fuel line leak before it descended so far down the social scale it ended life as a junk shed on Daddy’s farm. To me, that camper was worth every cent! Wonderful memories! The simple joys of life often provide the richest experiences. Awesome! this has always been a dream of mine.School bus and all. Don’t pay more than fifty dollars. It’s funny how the child’s eye view and the adult’s view can differ so much. Your father was a man of vision. It must have been great fun! Dying to know how you like it. Hope you do a review. I’d love to see the photo, Joey. See if this link works? Got it. Wonder if that as the first step in their Reno? Good plan. I stop and talk to almost everybody I see. That would make a difference. Great story. It reminds me of a certain ford van, many years ago. From time to time, I have “flash” memories out of the blue of camping with the family. We had army cots and mosquito netting. My dad was resourceful and hauled up a little construction shack that was set up for cooking, storage and sometimes keeping out of the rain. It was well organized. Eventually, a house was built but never completely finished though usable. I was so mad when my parents sold the lot and house because I knew we would use it more when we were no longer teens. My parents said “Well, ya’ll never wanted to go up there.” Duh, we were teens, we had busy social lives. Kids are just so busy. She is a wonderful woman. She’s 87 and still goes to the gym three times a week and walks two miles a day. Thanks Catherine. Heck yes! That beats sleeping on the ground and in a tent where the bears can get to you. Sounds like a fun old camper! I wish we’d used it more. I understand what you mean. What a fun memory. Makes me miss camping. We go in a real camping trailer, now. Somehow it’s not quite as exciting. Ha! We do too and it’s one of my favorite things to do. Growing up, we were not ‘camper’ types so I am late in finding out how much fun it is. It is the next best thing to being a kid again. Oh my, you really glued your heart to that camper, Linda! Totally different than I did… lol! It was fun. I still like camping and still love the outdoors. What an awesome memory, even if it wasn’t the best. It provided the best memories. That’s what makes it great. I still love thinking about it! Thanks. It was three or four days of high spirits, an oasis! Sure makes you rethink the plan, doesn’t it. Today $50 could not buy you the dream of a camper no matter how run down….glad you enjoyed it. It was fun. Wouldn’t have had that trip to remember without it! Too bad you didn’t think of that sooner. I could have fixed you up for $50!